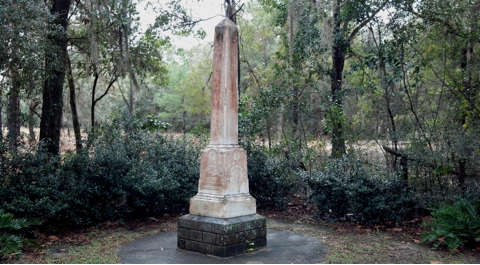 The Yellow Fever Monument is a prominent Obelisk in the southeast corner of the “Old Yard” at Evergreen. In 1887-1888 a Yellow Fever epidemic swept through parts of Florida. The Gainesville Guard was ordered to Fernandina to help the stricken city. Lt. Elam A. Evans and Sgt. Mosley Fitch Miller were among the many victims of Yellow Fever. Their comrades erected this monument in their honor in 1890. Originally positioned on the northeast corner of the downtown courthouse square in Gainesville, it was moved in 1926 to the entrance of Evergreen Cemetery. After being damaged by cars, it was moved to its present location at the southeast corner of Evergreen Cemetery.